Wondering why I am making Teachers day cards in July...? 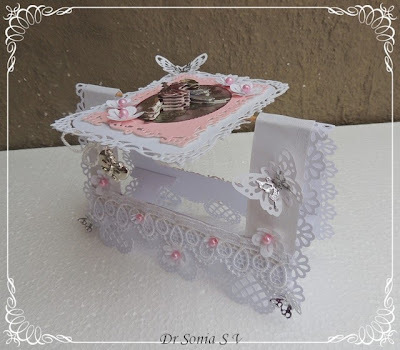 Well in India we celebrate Teachers day in September and my daughter has so many favorite teachers that I think I will need to make at least a dozen special Thank You style Teachers Day cards . 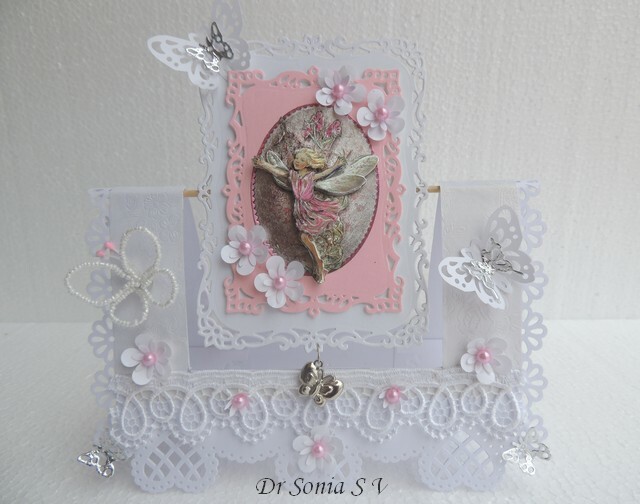 Crafted a 3 D decoupaged fairy who swings, spins and literally soars into the sky in this kinetic card! 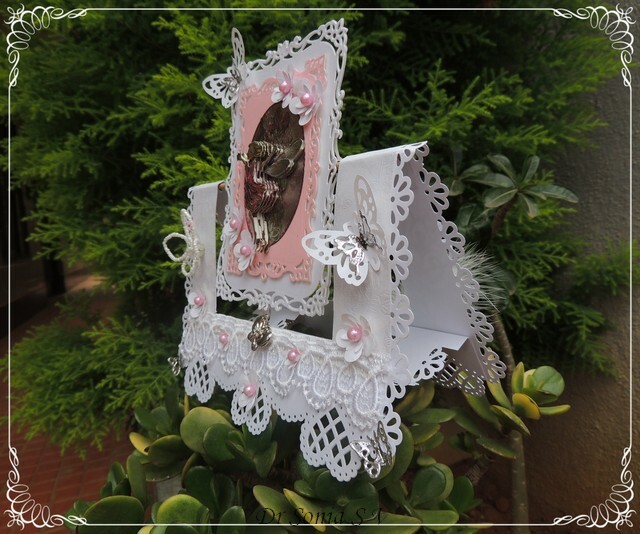 In this photo you can see how the butterfly charm dangles when the fairy spins up.My fairy has 6 layers popped up on foam and boy was she time consuming to make!! 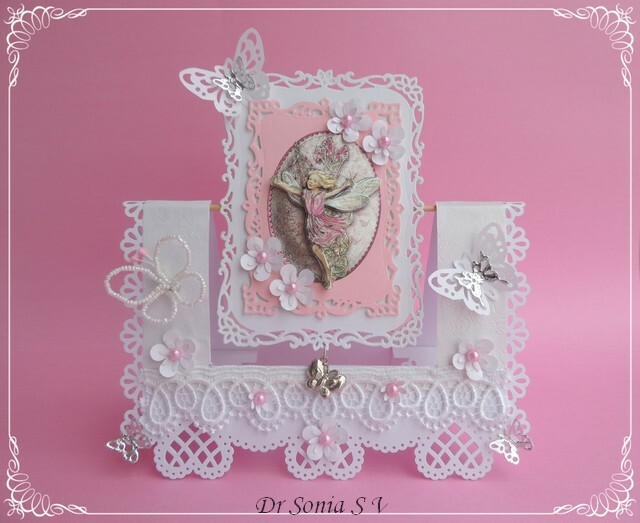 This design is one of my most popular card designs on this blog and here is the original spinning card. 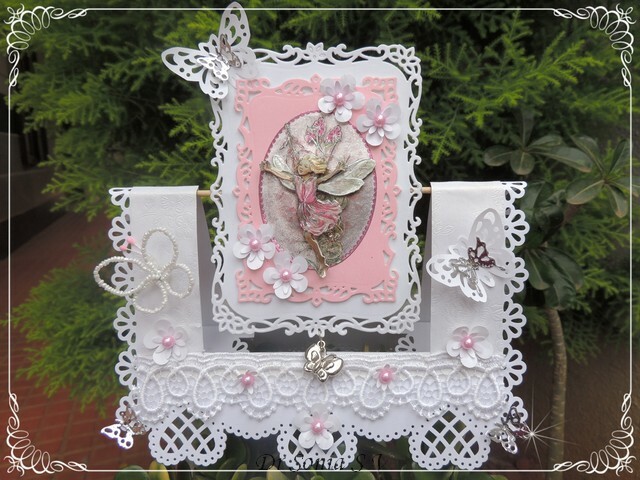 Some of my blog friends said they found my first spinning card tutorial a bit difficult so I thought I would tweak the tutorial a bit in this spinning card tutorial. Card stock - An A 4 for the base card and 2 roughly 4 x 5.5 inches pieces for the central spinner.Thick Card stock is preferred - The base card which forms your stand for the spinner needs to be particularly strong as it is a stand for your card and has to support the weight of your wooden stick and spinner card.The spinner card also should not be thin as otherwise it will be floppy and unsightly. Double sided tape or glue dots - makes life easier while making the central spinner. I trimmed an A 4 card into 8 x 11 inches and folded it in half to make my base card. Positioned the lower half of the Central spinner in the middle of the folded edge and marked around it leaving enough gap [1/4 inch on sides and 1/2 inch below]all around .This central rectangle is 1 3/4 inches from each edge [as shown by the scoreboard markings]. 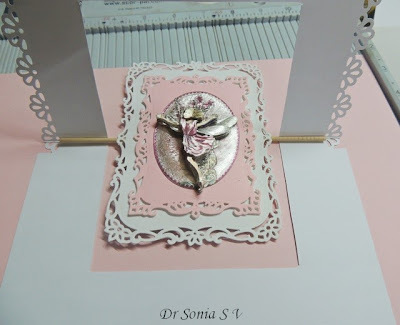 To Make the central spinner : Take 2 die cut/hand cut shapes [approx 4 x 5.5 inches]and center the skewer on one die cut as shown.Apply double sided sticky tape or glue dots above and below and stick on the other die cut/hand cut piece and you have made your spinner! Make the supports for your spinning mechanism: from thick card stock cut out two 2 x 1 inch strips and score at 3/4 inch , 1 and 1 1/4 inch .Fold this into an M as shown above.The gutters of the M support the skewer on either side of the central spinner.Stick the long legs of the M inside the folded top edge of base card.I stuck the M legs of both strips [on either side of spinner aperture] on the inside of the back half of the base card first, then placed the skewer in the gutter and glued on the other leg to the inside of the front half of the base card. Your spinner card is actually done but it may have a tendency to fall especially if your spinner is heavy. And here is the front view with a fairy child soaring up into the sky in this Teachers Day card!!! Thank you for sitting through this long tutorial. Since its a technically tricky card design I wanted to give as many details as possible. Do tell me how you like it. 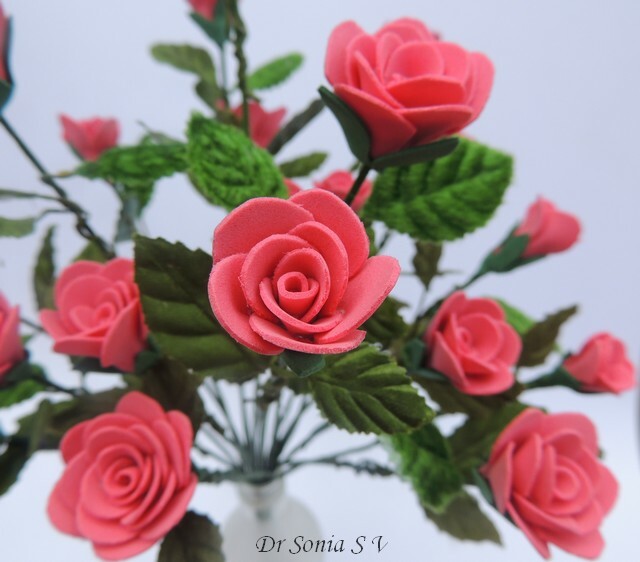 Dear friends it was so heartwarming to read the wonderful comments on my foam roses tutorial and I was even more touched that many of you commented how difficult it must have been to write a tutorial! !Yes taking pictures for tutorials is time consuming but then I always feel I owe it to my readers to explain how I made something!! 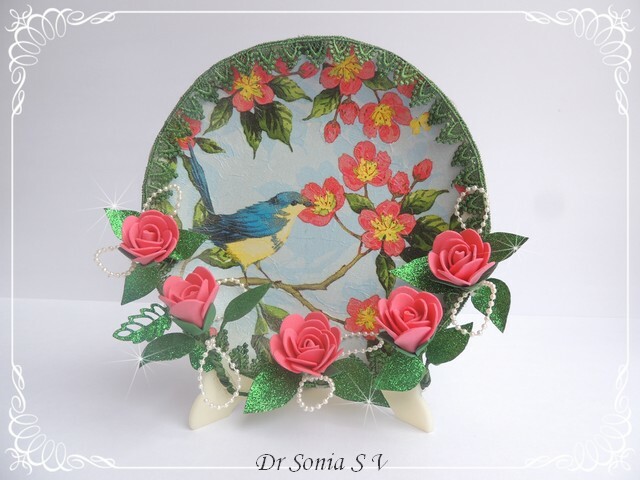 Sharing one more home decor project- a decoupaged plate . 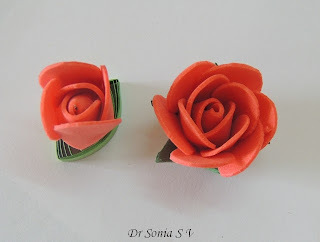 Since making the earlier type of foam roses was so easy I tried making a different variation by giving a bulbous center to the handmade foam roses. 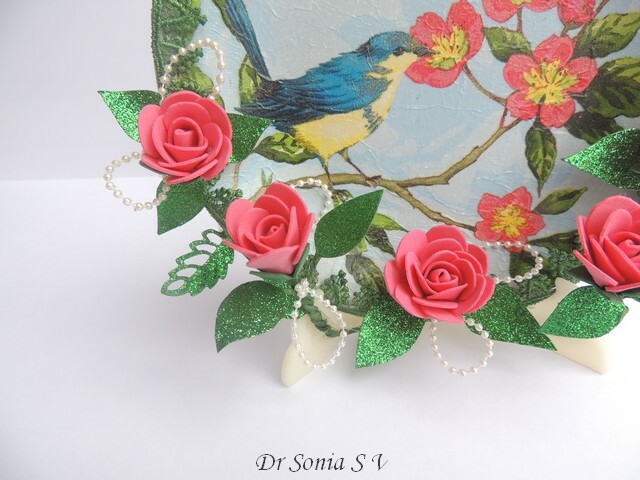 Tried Napkin decoupage for the first time using some gorgeous tissue papers I had won from Unstampabelles. Decoupaged a ceramic plate and added some of my handmade foam roses. 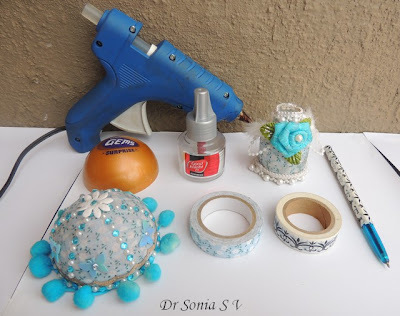 Glue gun- this is indispensable unless you want to spend hours trying to stick slippery foam!! 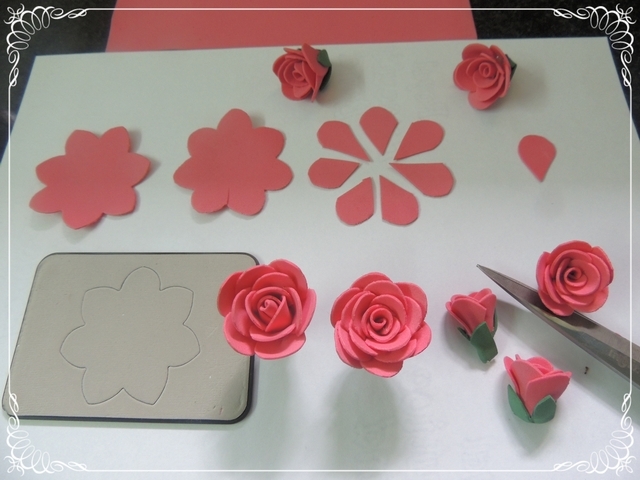 Petal template-My foam roses are made from tear drop shaped petals the width of my fingers. Or use your fingertip as a template [the upper curve is what you need!] 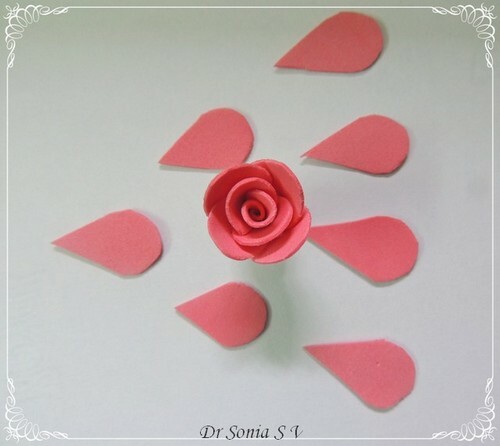 to quickly cut up some tear drop petals!There is no need to cut the petals all uniform as after all its a rose you are making and petals do differ in size and shape!! 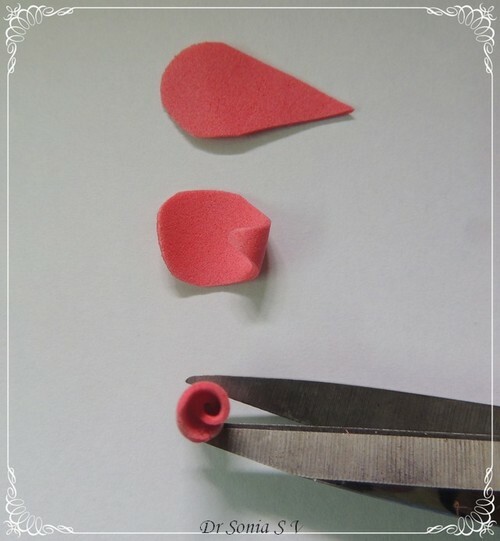 To make the bulbous center:Take one petal and roll it from tip to lower part of rounded edge to form a cone as shown above and hot glue it with the pointed tip inside. 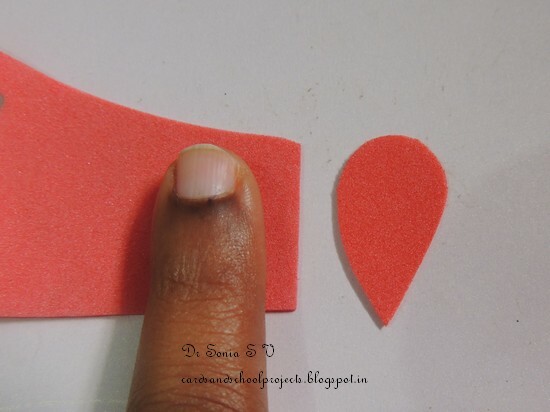 Dont worry about glue smears on your inner most petal[as shown above] as its going to be hidden inside another petal! Apply a streak of glue lengthwise on a petal [as shown above] and below ]and wrap it around your innermost conical petal. 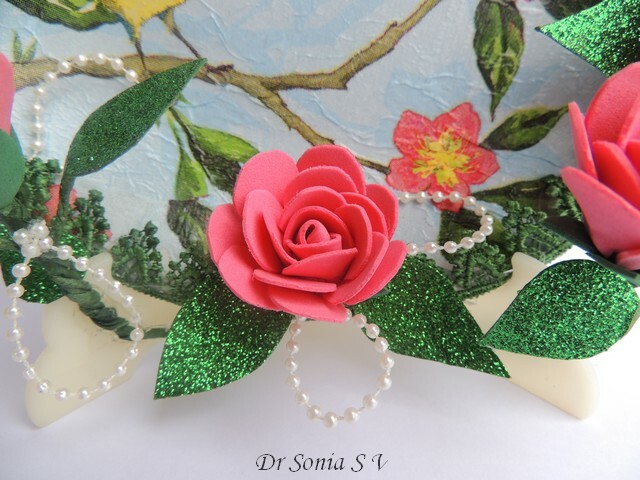 Glue on your 3rd petal in such a way that its rounded end will overlap the pointy tip of the 2nd petal as shown above.The foam rose bud actually stands! In the next layer I changed the position of the glue to the lower part of the petal as shown above and stuck 4 petals overlapping each other. 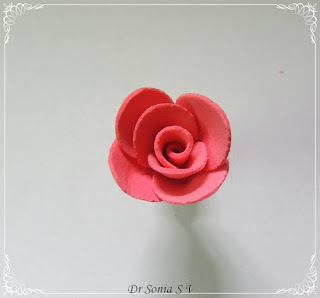 Add 5- 6 more petals as the outermost layer and you have a gorgeous handmade foam rose. 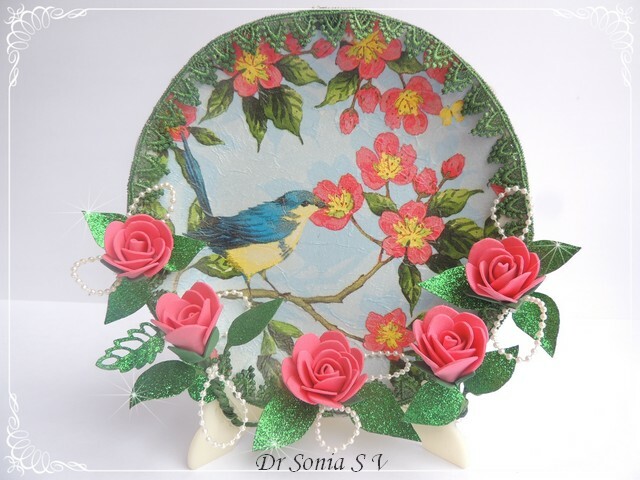 Made some of the roses stand out on branches made with wire and floral tape as I wanted the little bird to have a lovely 3 dimensional rosy scenery!For a bit of glamour ,added some pearl strings at the base of the foam roses. 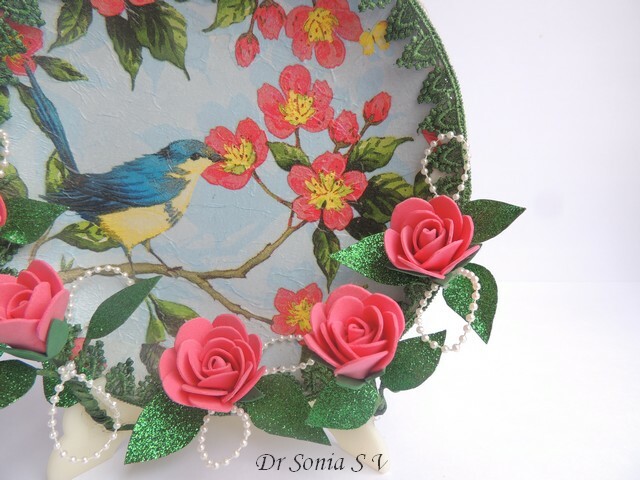 Even though it was my first time ,I loved the beautiful texture of the napkin decoupage on the plate.Now on the hunt for more crafts to use up my stash of foam roses! 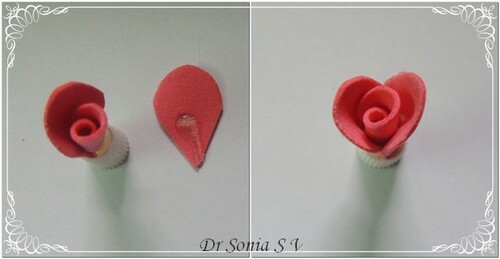 Hope you liked this amateur napkin decoupage project and foam rose tutorial..do leave me your thoughts! As most of my friends correctly commented in my last post ,my current craft obsession is home decor projects! 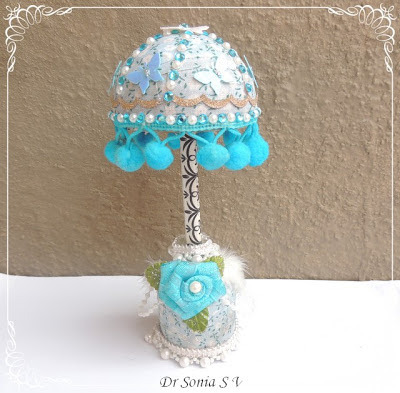 And since I get only snatches of crafty time nowadays flower making seemed the best outlet for creative cravings! 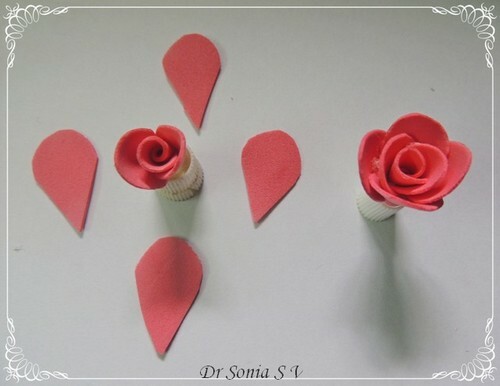 !Sharing my experiments in making handmade foam roses. 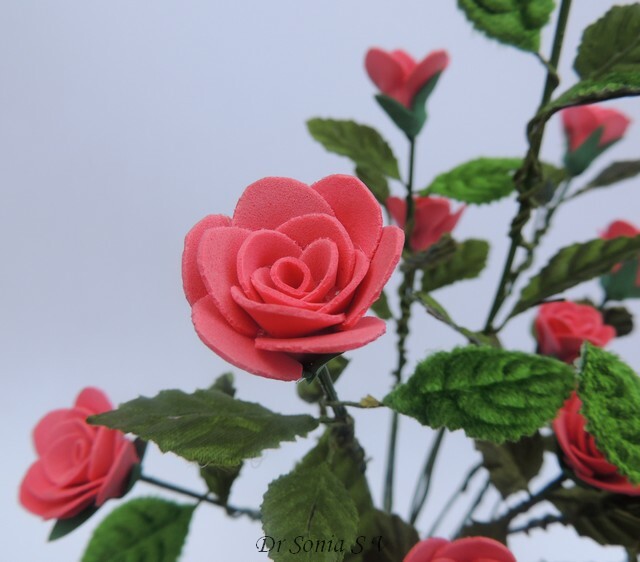 Making the foam roses was rather easy and in fact a bit addictive so I ended up making a whole bouquet of foam roses!And yes sharing the handmade foam flower tutorial. 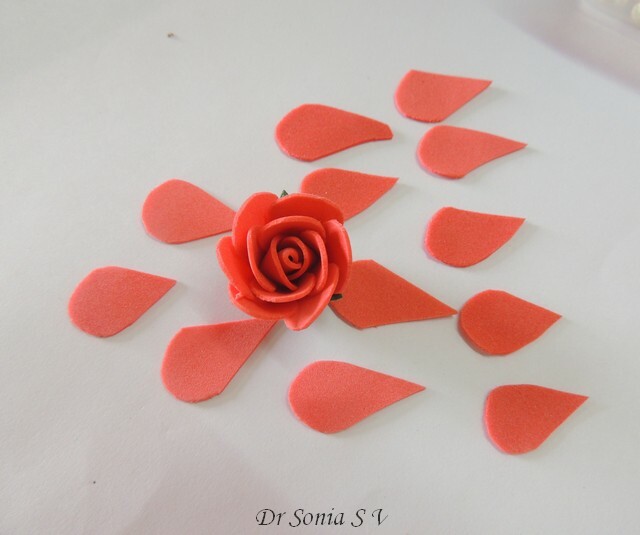 You can use your finger tip as a template for the petals and no need to make the petals all uniform as after all its a rose you are making and petals do differ in size and shape!! Since I have a die cutting machine [bigshot],I die cut some pointy tipped flowers[Sizzix sizzlit die set 3 flower layers],rounded off the pointed tips, cut them up into petals .I didnt like the jagged edges so used the scissors to round off sharp edges.Please dont despair if you dont have a die cutting machine as its even more easy to hand cut the petals of your foam flowers. To make a rosebud as shown above ,I used 1+2+4 = 7 petals. To make the center of the bud roll a petal from the pointed tip as shown and apply a bit of hot glue to secure in place. The trick in gluing the outer petals is to just apply a dot of glue at the lower half of the petal and press just this lower part onto the central bud using your fingers as shown in the picture of the foam flower tutorial. If you put too much glue on the petal it will seep out and burn your fingers when you squeeze so err on the safer side! This tutorial actually is in many ways similar to this clay rose tutorial shared earlier.Here is the completed handmade foam rose. 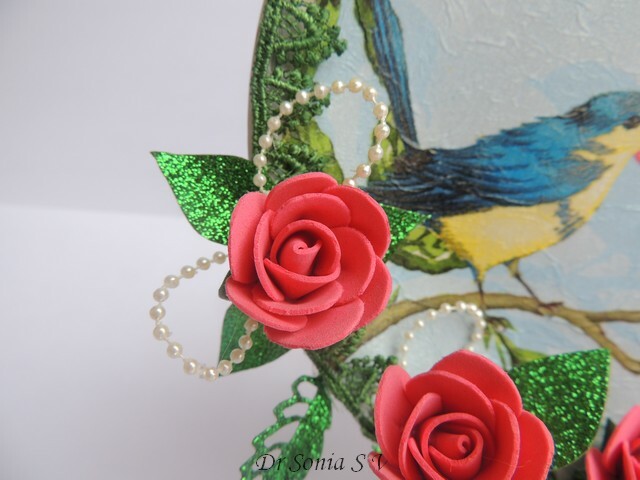 Keep adding more petals to this bud and you get a fuller foam rose flower. 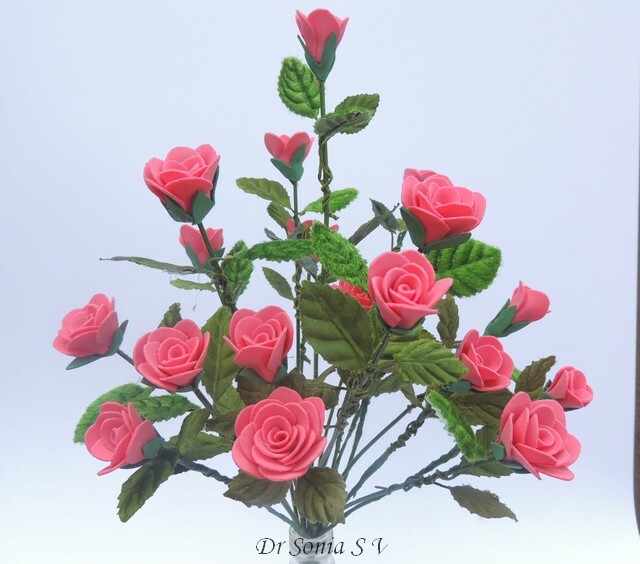 Also sharing how I made the bouquet of roses.I initially handcut the sepals of the roses from green foam sheets but I somehow didnt enjoy that so later used a Sizzix star die and cut out some stars and reshaped them into sepals for my foam roses. I inserted thin metal sticks into the foam roses and secured the sepals in place using the glue gun.Finally wrapped floral tape around the flower stems and twisted on some fabric leaves to make my bouquet of handmade foam flowers. Wondering what are those huge cream flowers...? 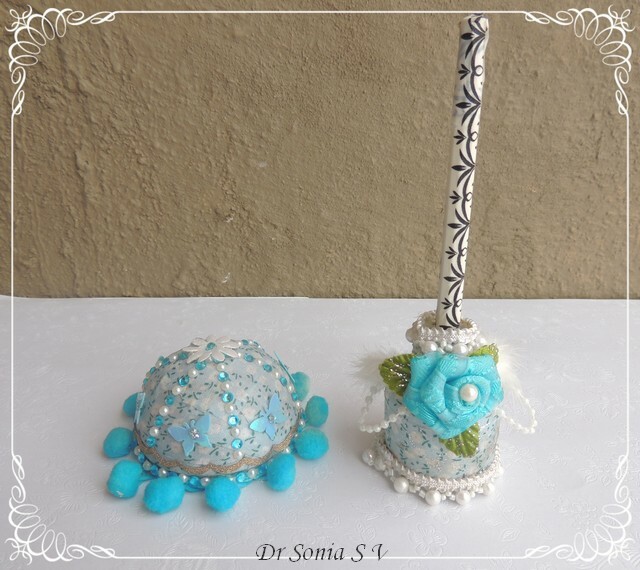 Well they are handmade flowers too ...from a peculiar material called sola wood! 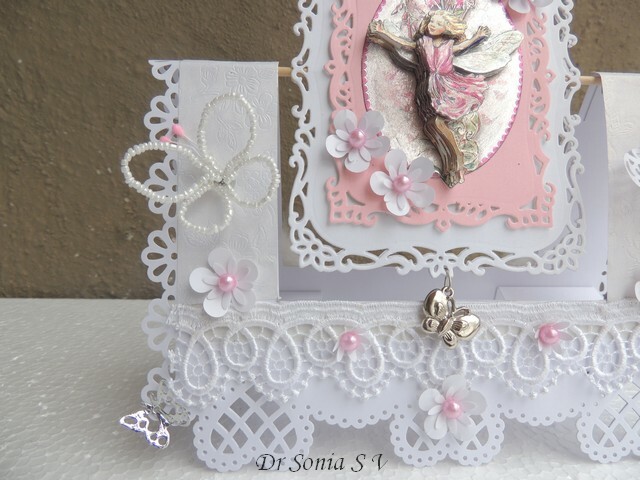 Will soon be sharing a tutorial on how to make sola wood flowers. 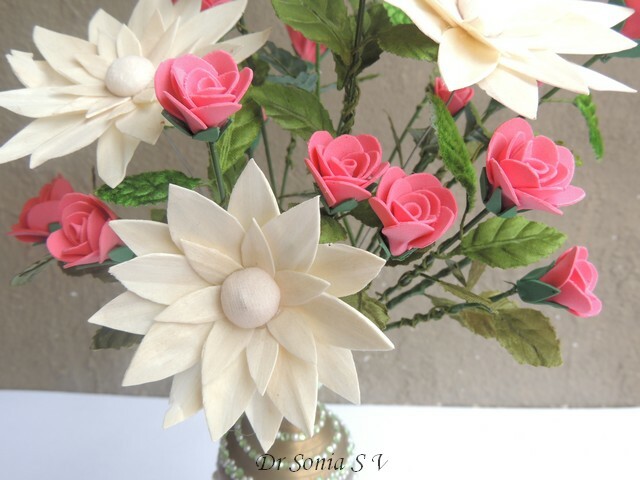 Do tell me how you like my handmade flowers and about your own experience with foam. 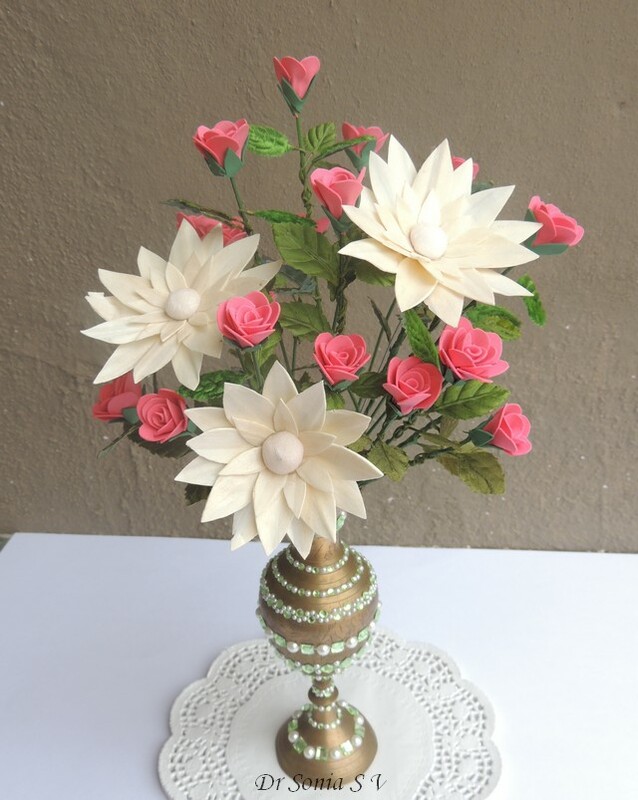 Here are links to some "non paper" flower tutorials. 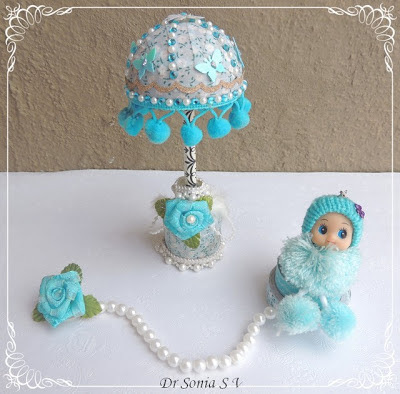 Dear friends it feels wonderful to be back to blogland! I was so thrilled that so many of you missed me enough to email ,comment ,message and even call me up to see if I was alright !Thank you so much ....I was so touched!! Well we had bought a huge new house and all my time went into caring for it so I couldn't craft or blog! !Now things are settling down and hopefully I will get snatches of crafting time! My blog friend Priya owns an awesome craft shop and she sent me some Washi tape to use in a recycling craft.This is the first time I tried washi tape and boy it was so quick and easy to use washi to recycle some plastic containers into what else but a DIY washi tape/ ribbon holder! My ribbon/tape holder looks like a little lamp shade [My inspiration is the gorgeous wine glass lamp shade made by the super talented Daksha] .The hood comes off and you can place the ribbon/washi tape on the shaft [which is actually an used pen wrapped in washi tape] of this DIY ribbon holder. The pic shows all the washi tape I own but even if you have a huge collection you can easily and quickly make any number of these ribbon holders as its a super simple inexpensive recycling craft. 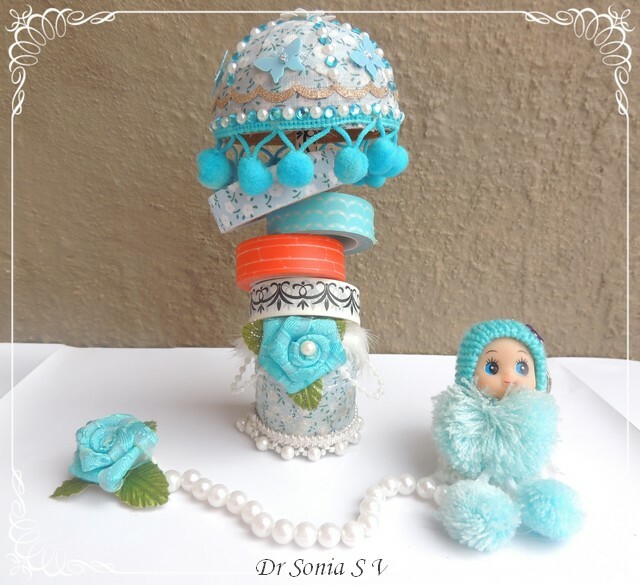 Washi tape--makes beautifying plastic super easy and quick as the pretty tape as its own strong adhesive! Make the Base of the Lampshade-I recycled a mosquito repellent bottle to form the base of the lampshade. 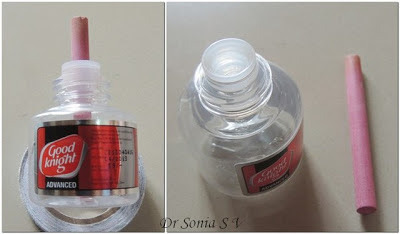 I removed the pink stick and rinsed the bottle to get rid of all the residual insecticide.The plastic rim inside this bottle snugly fits a pen or pencil.You can use any small necked bottle as an alternative and if your bottle neck is large ,make it small enough to fit your pen with clay/sponge/paper/any other crazy thing you can think of! 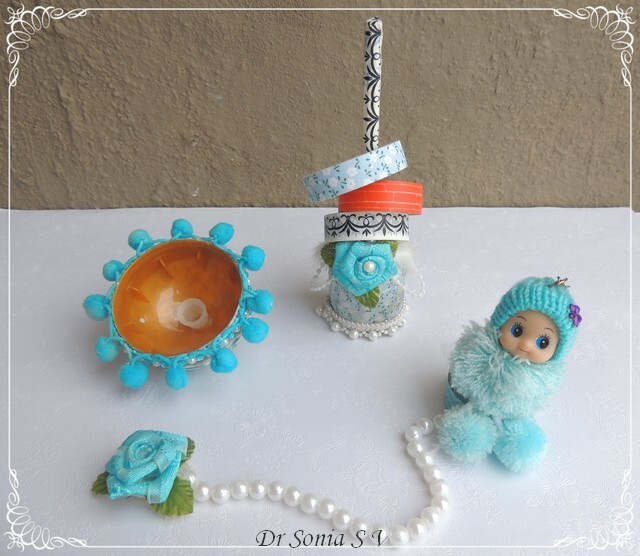 Make the Dome of the lampshade-Cover the hemispherical dome of the plastic container with washi tape.Stick the inner plastic rim from another goodnight bottle on the center of the inside of the dome using a glue gun /double sided foam tape /other strong adhesive.Alternately fashion this central stopper using clay or mseal wrapped around your shaft so as to form a snugly fitting stopper for your DIY Ribbon holder. 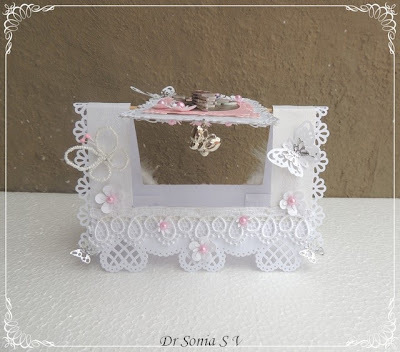 I used sticker rhinestones,plastic butterflies,glitter strips, pom pom lace,pearls ,feathers and a ribbon flower to embellish my DIY Ribbon/Washi tape organizer. 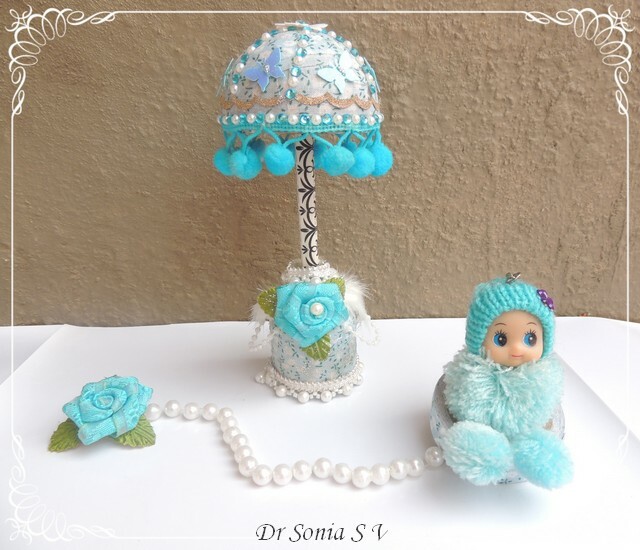 Eagerly awaiting your comments on how you like this super easy project.